o, what do you do when a teacher tells you they are saving you a spot in a class, even though you aren’t a major in that field? A class you really, really want to take, a class that is really hard to get in to (go interviews, teacher has to pretty much know you and portfolios/sketchbooks! ), a class that is only offered once per year. A class that this might be the last time it is offerered*. And most importantly, a class that only accepts ten people a year. Add to that that I would just be in, she already knows my work and wants me in the class since she knows it’s something I am interested in. Well, if you are like me, you accept, duh! And make the rest of your schedule fit around it- I’ll have seven + straight hours of classes several days a week, which should be fun in addition to the anthropology classes I’m taking, this class is really time intensive. O yea, and what is the class I guess would be your most important question? I get to design a rug. Not a small bath matt size rug. O no. We are talking a custom (probably 7x10 + ) rug for a client that sponsors the class. A rug that is handspun, hand dyed, and hand woven to my specifications for the client in Nepal in workshops that have been carefully selected by the teacher. Continuous warp, hand knotted everything…you get the picture! The class is also a business relations class for artists, so it’s awesome I get to take a class that applies so well to what I do even though I am not an art major. * Revolution in Nepal makes the rug industry unstable and the country problematic for touring there and the teacher goes to oversee the rugs being made. 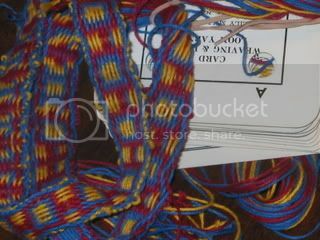 I also learned how to card weave yesterday- I’ve read and researched it before, but when I found out my weaving instructor knew lots about card weaving, had traveled to Peru to learn about it (and other traditional techniques), well I had to learn how to do it! She was really excited to show me- practically dragged me down to her office to find me a book and some cards, and well…now I have a new addiction! My card weaving is not so pretty yet- I’m using a rather random rug warp and need to work on my tension (who am I kidding, my tension is always bad!). I just find it fascinating that you can get something that looks like a twill, and even do double weaves, with a series of cards (as many as you can hold, or you can tension them on a loom), and that card weaving has been done for centuries and centuries. Ancient Egypt, China, Russian, so many places have versions of card weaving, using cards made out of materials local to them- wood, bone, ivory, hides, even playing cards can be used when cut down. 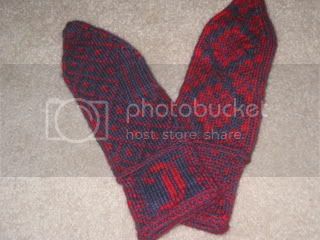 And while on the subject of obsessions, someone threaten me about writing up and properly charting the three (that I will own up to, that is) patterns for fair isle mittens and wrist warmers that I have worked up lately.